The problem: Despite living in a relatively warm climate, we struggle to get acceptable performance out of the system. I've never managed to get the interior temp above 68 F if the daytime isn't a full sun day. If we start cold the system will run all day and maybe not even pass 66 F. The floor temps (using a laser thermometer gun) max out at 74 F in a few spots. Most are at around 68/69 F. Some spots are around 65 F, but I think that's due to my layout in the bathroom not having space for multiple bays and being close to a crawlspace vent. I've flushed the system multiple times with the hope that it was air causing the poor performance. I do that by running all hot water taps in the house (with the water heater off) through one circuit at a time for at least 10 minutes each. That showed no considerable difference. Do you have any idea what the heat loss of your building is? That would be the first thing to check. There are some handy calculators -- Slant/Fin has one -- which aren't too hard to use. At your flow rate, with the delta T's you are quoting, you are only getting between 6,000 and 12,000 BTUh out of that system into the floor -- 13 BTUh per square foot. This might be enough... but until you know the building's heat loss, you can't tell for sure. How thick is the sub floor, below the wood and laminate? Tubes fit very snug inside aluminum plates, or loose fit? Don't recommend a nest for this application. Your circulator is undersized. Why do you think your are getting 2.3 gpm? I think that is impossible. The curve for the water heater is in PSI. I suspect the actual flow is < 1 GPM. This problem is posted here on a regular basis. You're not the first to suffer from a RadiantWreck system. The simple truth is you've been sold the wrong appliance (a water heater) in place of a boiler. The tankless is not designed, controlled or approved for space heating. The biggest issue is its heat exchanger's high resistance to flow. It's designed to have 60 psi incoming and an open faucet on the other side. It also designed to have 50* entering water and 127* leaving (a 77* delta T). The circulator on your system can produce about a 5 psi pressure differential. And a radiant floor in a living area is typically designed with a 10* delta T. The resistance (head) of just your floor is gonna require everything that the circulator can do. Add to that the massive resistance of the heat exchanger in the tankless and it just ain't gonna work. Are you begining to see the problem with using the tankless? The only short term solution is pipe the system in primary/secondary and put a very large circulator (like a Grundfos 26-99) on the heater loop. Then, when the tankless fails, put in a properly sized mod/con boiler. Think for a moment: if a tankless could take the place of a boiler, there would be no need to make boilers. Also: ditch the Nest. Radiant systems are designed to be set at one constant temperature and will actually operate more efficiently that way. A Tekmar 518 (or similar) is the correct thermostat for a radiant floor. Thank you, everyone, for the great responses! I'll try to respond below. 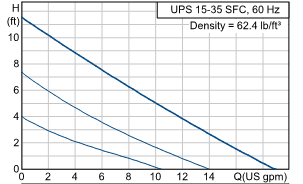 I'll take a look into doing the heat loss using the Slant/Fin calculator, and I'll get back to you about that. Our original quote from the company had their heat required estimate at 27,000 BTU/hr. A big difference! They also were expecting 3.75 gpm, but as mentioned I'm only getting (I think) 2.3 gpm. I can't recall exactly right now. It was either 1/2" or 3/4". My tubes fit snug in the aluminum plates. I'm quoting the flowrates off of the display on the tankless heater when the pump is running. I do not have a separate flow meter. Do you think the tankless could be reporting incorrect numbers? I would say the tankless gpm is off. Most likely less than reported. Especially with the circulator used, and the high head tankless. The narrow delta would suggest a higher flow rate however. The average water temp is pretty low for a suspended tube application. Could try raising it to 140 see if that helps. Maybe even 150. Was the rim joist area well sealed, and insulated? What is the desired setpoint for room temp? The heat flux of that floor is not much when it’s 66-68* surface temp. I wouldn't even worry about heat loss or boiler flow at this point. The way it is piped, or so it appears, the cold water from the house flows in to the tee just above the pump, and then flows all the way through the radiant floor piping, before going in to the water heater.Even if it was piped right, and the heat was working ok, every time you use hot water you will be running cold water through the radiant floor and effectively cooling off the floor again. The only thing good about this piping configuration is that you are less likely to have stale water in the pipes in the off heating season, which is better for your health. I am not sure how you bled the air out, but in order to do it properly, you need to turn off all the valves on each manifold. Then open up one valve on the supply manifold and one on the return manifold, making sure it is the same loop. Then I would close off the valve on the hot water outlet of the water heater, the red one, and hook up a hose on the drain hose valve on the hot water outlet of the boiler, which is right above the red shutoff valve, and pointing the the left. Then , open up the drain line on the water heater and run it until the air is out. After it is clear, close off the valves on the manifolds and open up the next pair, and flush each consecutive set, one at a time. If I am right, you will probably get a lot of air out. The other thing is that needs to be done is to have an air vent installed at the very top of the piping just above the pump, because every time you use any hot water in the house, you will be adding more air into the system. Ultimately though, you really need to have it re-piped properly and with the house hot water separated from the heating portion. Rick makes a good point. 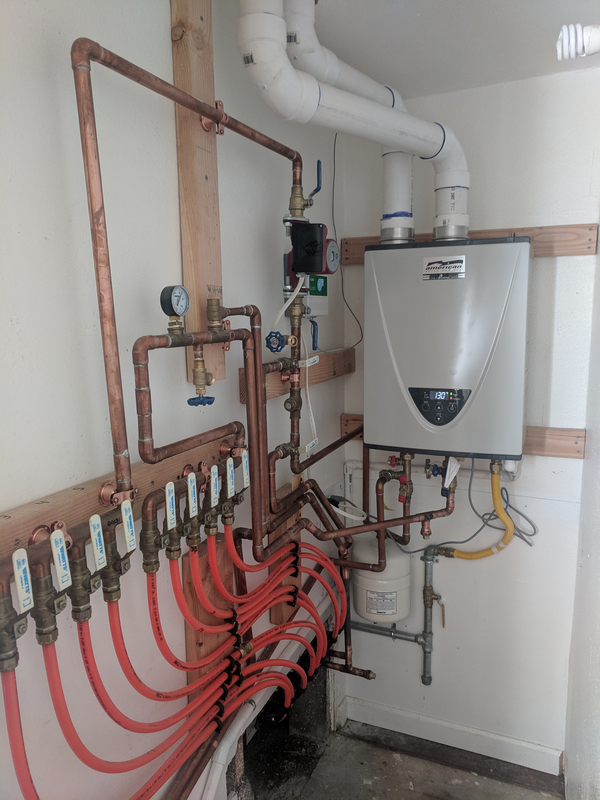 If the cold is going in the top connection, what you have is radiant cooling anytime you are using hot water and undersized radiant heating the rest of the time. Any chance you have an installation drawing from these fools? Im beginning to think these Takagi systems need to be outlawed. Every single one that's posted on this site looks like a mess installed by someone who has never seen a proper boiler. Well the way it’s “suppose to work” is the domestic hot water gets priority if the radiant is heating. Missing, or misplaced check valve? I’d like to see a more frontal shot of the piping on the left wall. Maybe label the domestic. And officially any and all components used will need to be low lead listed if they touch the potable water, including all fittings, air seps and vents, etc. I suspect many of the online system may not be code compliant from that perspective. If they supply or recommend components. Hi everyone. This thread seems to be verging on an open-direct-systems-are-stupid kind of conversation, which isn't helpful with my current situation. I get that this setup isn't for everyone, but it's a decision that we've made with our eyes wide open and it will be staying that way for the foreseeable future. And yes, we triple checked that all parts used are no/low lead (including several returns of mislabelled valves), code compliant, and rated for potable use. The system has also been inspected by the city and passed. Regarding cold water flowing through the house before going to water heater - yes, that's how it's piped and that's how it's supposed to be. We've run the system for 4-5 hours in the middle of the day when we weren't using any domestic hot water, so that's not the reason for the low floor temps. And in practice, the amount of hot water consumed by a 1.0 gpm faucet run for two minutes is not going to fill my floor with cold water. And we'll take care not to do laundry or take 45 minute showers while we're trying to heat the house. Hi Gordy, thanks again for the detailed response. I tend to trust the flowmeter in the heater due it correlating well with other factors. For instance, I have low flow aerators on my faucets rated for 1.0 gpm. The heater will only turn on at 0.5 gpm, and in practice, I find that my faucet does not turn on the hot water until I get into the upper half of the flow range. When I check the reported flow rate it shows around 0.8 gpm, which all falls within reason. I'd be surprised if the flow rate from the circulator was off by a factor of 4 or 5. And this also correlates with the low delta T, as you suggest. We can go up to 150 F, but I'd prefer not to go higher than 130 F as this is also the domestic hot water. If I did go higher I would need to add in a mixing valve to prevent scalding. The rim joists are not insulated and note that it's a vented crawl space (typical for California). The desired set point is 68 F.
Not using setbacks (that I know of) since this is using Nest's radiant heating program. Also, I've attached a frontal picture of the piping when it was in process. The check valve is visible on the right. I do wonder if the check valve or filter on the heater could be clogged and causing low flow. And finally, I realize I have not yet balanced the circuits. Their lengths are within about 20% of each other. Should I expect that to hurt performance as I've seen? The rim joist are can be high loss if not insulated, and sealed. You will get convective currents from the cold rim joist area. A suspended tube doesn’t give a lot of output at those temps. Even though your heat loss is low. If your room set point is 68, and the floor is 68 there is little heat transfer from the floor to the space. Have you expressed your concerns to your system supplier? I would also check any filters in the system. Being new it could be picking up contaminants. Also water quality from the source. I would also measure supply, and return temps of each loop will running. Use painters tape at the location you are shooting with the IR thermometer. It will at least give you an idea if loops are getting the same temp, and maybe being air locked. Most radiant hydronic systems are very slow to repond. I doubt that 4-5 hours is a good test. If you run the system for say 24 hours with no use of domestic hot water, that would be a better test. Many radiant hydronic systems will respond at a rate of less than 0.5 degrees/hour depending on thermal mass and thermal resistance of floor coverings and such. I looked at Radiantec extensively before installing my workshop system. Thankfully, I came to this forum first and spent time lurking here and watching most of the videos at the Taco University site and the Coffee with Caleffi videos. 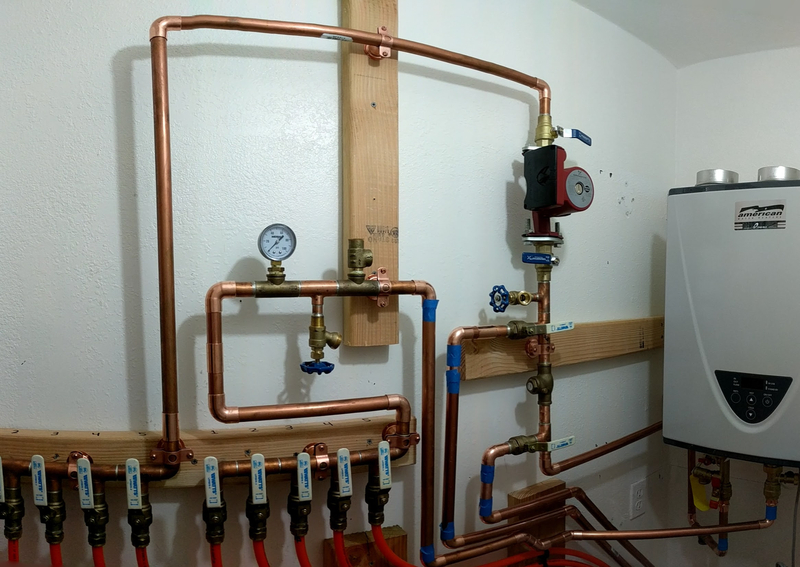 I still elected to install my system myself, but I decided to use a real boiler and follow the P/S piping design that most now recommend. I have no regrets. Sure, it cost me a couple thousand more, but I have a very effective and efficient system and I hope will last for a long time. You have a poor design that will likely be trouble forever. I am sure the folks here can help you apply some useful bandaids such as higher SWT and more flow with a higher head pump (I used a Taco 0011 to get good flow in my high head system) that will make your system better, but the reality is that you will always have a poor system. However, as you said, you consciously chose to have a poor heating system so at least you should not be too surprised. Yes I agree @Voyager. These systems never work correctly especially in open loop applications. I've seen so many that had to be ripped out and redone with the correct material. Tankless Water Heater a big no no. The OP openly, and with full knowledge about open systems made their decision. They were asking for help. > The OP openly, and with full knowledge about open systems made their decision. They were asking for help. Maybe so. However they made the choice. It’s called heating help, not heating bash. remember this is SF, maybe 30 degree design temp? I agree, @JUGHNE, and that’s what I look at. It’s not a huge load for a maybe not the best system, but can do the job. There were a few things that could be checked assuring air bound is not an issue, or poor insulation at the rim joist detaiL. Ignoring poor choices does not help people. It is good to learn from one’s mistakes to avoid repeating the mistake in the future. Gordy has a point, I have no right to insult anyone. I come here because this place is all about helping people with heating issues. I've asked for advice and help just as much as I've offered it. Sometimes I don't know when to keep my opinion to myself. For starters I would seal up all the crawlspace vents. They serve little function (contrary to conventional wisdom) and will increase the heatloss. Get as much insulation (R-21 minimum) under the floor and on the sides of the space. I too think re-piping primary/ secondary is a good move. 1 circ. pump for the tankless 1 pump for the system. I’ll always try to steer someone away from such a system when they are contemplating that type of choice. Try shutting off all but one set of loops, and see what the water heater does, and then go to the next loop. If all the loops are bled correctly, the water heater should show the same flow through each loop. If it does not show flow in any loop, then those loops need to be bled more. Awfully hard to make chicken soup out of chicken poop. I've seen and repaired/corrected a few Radiantec systems. Always became a problem when the outdoor temps dropped near design temps. Failure to insulate under the floor joists was another problem, as well as lack of transfer plates. It's painful to see water heaters used as the heat source, but that's what's done. A boiler is always the preferred means and will provide BTU's when the water heater can't. Homeowners who have installed these systems have some choices to upgrade for increased efficiencies, but the additional costs make it a hard pill to swallow.